Skincare infused with crystals might sound fancy and expensive, but what are the real reasons you should add quartz crystals to your skincare routine? With the popularity of skincare rising in the beauty community, there comes plenty of products that are meant to wow you, but not to actually heal your skin. For example, do you really need a gold-infused face primer for $74? The answer is no, because there are no real benefits provided by the added expense. Instead of falling into this trap, discover the products that provide true proactive properties for your skin, and your overall health and wellbeing. We have come up with a list of the best reasons you should add quartz crystals to your skincare routine. From the pure positive energy provided by the mineral to pore minimizing and anti-aging properties, your skincare routine will never be the same again without a dash of these healing crystals. Before we even start providing some of the best reasons you should add quartz crystals to your skincare routine, let's go over what exactly the crystal is. An abundant mineral, quartz crystals are typically colorless and often twinned, intergrown, or distorted; they are composed of silicon and oxygen atoms. Though often colorless, it can also come in shades of pink, hence the rose quartz, or purple, which is known as amethyst. A crystal with a long history of use, the mineral has been used in ancient Egypt due to its healing powers. It is also referred to as being the love stone. A gemstone used to attract love, it not only has healing properties but can be used in rituals to attract love as well. How do I add them into my skincare? 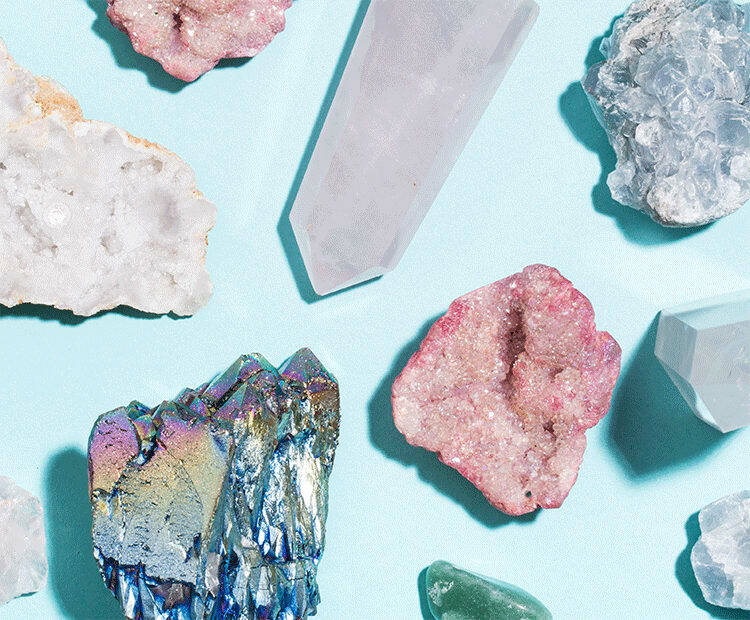 We're obviously not going to suggest rubbing these crystals directly into your skin, or just waiting for the presence of the crystal to heal your skin on its own. So how do you add it to your skincare routine? There are plenty of ways to add this mineral into your routine, and the first way to do so is to simply add the crystals to your filtered water. Let them soak in the water for about 10 minutes and then remove. Once done, add the water to a spray bottle, and spritz the concoction onto your skin. Another great way to do this is to mix your favorite powdered mask into a bowl with your now-made crystal water from your squirt bottle. And finally, one of the simplest ways to incorporate quartz crystals into your skincare is to find a skincare item that already has this as one of the ingredients. Many natural beauty brands are including crushed crystals and gemstones into their products, and they're flying off the shelves. So now let's get into the reasons you should add quartz crystals to your skincare routine. They will fill your body with positive energy. Let's start with something that isn't specifically skin related, but a benefit that is certainly something that is beneficial to anyone: quartz crystals have the power to fill your body with positive energy. Used from ancient Egypt to now, this crystal has been used to promote happiness, positivity, and dissipating negative energy. Especially when there are problems caused by love in your life, rose quartz is typically used to promote self-love and romance. They minimize and clean out your pores. Rose quartz is one of the main ingredients in some of the best skincare. Among the many reasons why this crystal is beneficial, it can unclog and minimize your pores. And who doesn't want that? A cleanser that can get deep into the problem areas of your skin, say goodbye to large pores and shiny skin. As one of the biggest reasons you should add quartz crystals to your beauty routine, this Sjal Balans Deep Pore Cleanser is the perfect example of a skincare product infused with quartz crystals. Plus, it's chock full of other helpful and natural ingredients that will clear away dirt, dead skin, and oil. Brightening and protecting, your skin cells will be rejuvenated in just one wash.
Another great property of skincare infused with rose quartz is that it will help brighten your skin. The mineral is added to bring light to your skin, and protect the face from uneven skin tones. Brighter looking skin is in your future with this simple ingredient. Rose quartz will relieve stress and tension. Stress relief is something everyone can find appealing. A benefit that can encourage a domino effect of other benefits, minimizing your stress will also promote rejuvenation, happiness, and relaxation. As one of the best reasons you should add quartz crystals to your skincare routine, tension, stress, and lost sleep will be no more. What is microcirculation? It is the circulation of blood in the smallest blood vessels, which will provide your skin with a refreshed, rejuvenated, and flushed appearance. There is even Physical Vascular Therapy that improves your microcirculation that many people pay hundreds of dollars for. Incredible for your skin, including quartz crystals in your skincare will benefit this process greatly. They have anti-aging properties, too! Next on our list of the best reasons you should add quartz crystals to your skincare routine is something that we've touched on previously, but need to drive home due to the incredible resource that quartz crystals provide for aging skin. Promoting youthfulness, this ingredient will attack any wrinkles or fine set lines in the face in just one wash. Masking your face with a rose quartz product will smooth the skin and give you an instant, but natural, facelift (for a quarter of the price, and with no recovery period). They work great for sensitive skin. We understand that people with sensitive skin are wary of trying out new beauty products, especially with new mystery ingredients. However, quartz crystals can be used effortlessly on those who suffer from sensitive skin. Even more irritated skin can benefit from the healing properties of quartz crystals. Used as a very soft exfoliant, you will be able to rid your skin of dead skin and unwanted dirt without causing a flare up. Finally, because Cleopatra did it! Saving the best for last, to complete our list of the best reasons you should add quartz crystals to your skincare routine, we had to mention the fact that Cleopatra swore by using quartz crystals to preserve her ageless beauty—rose quartz, specifically. She would use this mineral to exfoliate, rejuvenate, and cleanse the skin. Who wouldn't want to have the Cleopatra glow? And to name drop a little more, celebrity facialist Georgie Louise uses rose quartz in her skin treatments, and she works on clients such as Emma Stone and Linda Evangelista, two beautiful celebrities with jaw-dropping skin.